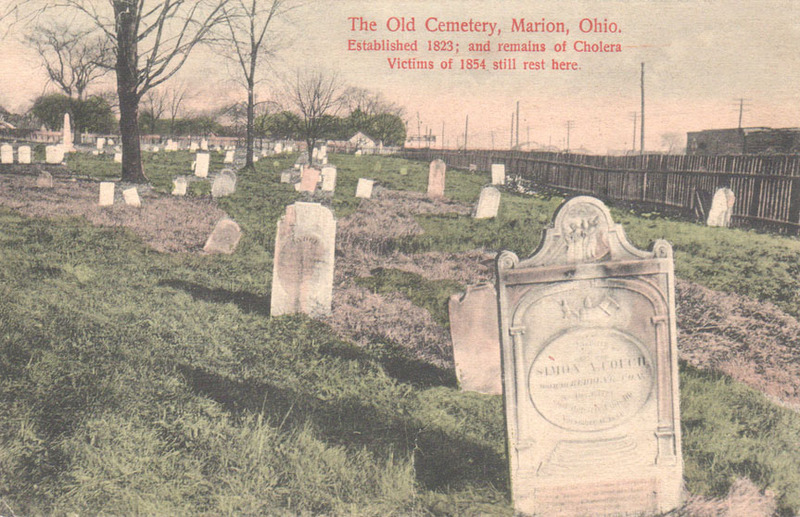 Please note: A significantly expanded version of this story, including the origin of a rumor that people were buried alive in the Quarry Street Cemetery, appears in our book Haunted Marion, Ohio. 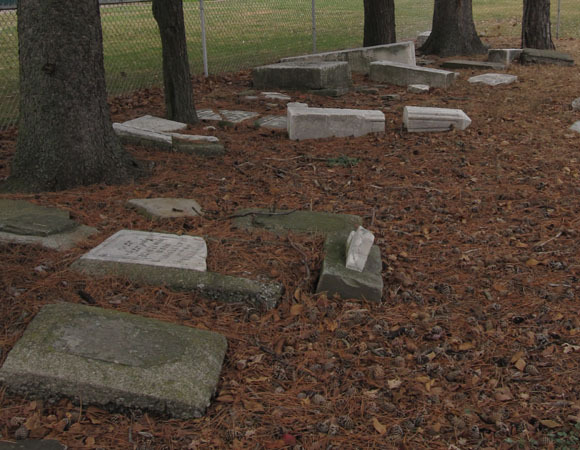 If asked to name Marion’s oldest cemetery, most people around town would probably guess the Marion Cemetery, home of the famous Merchant Ball. 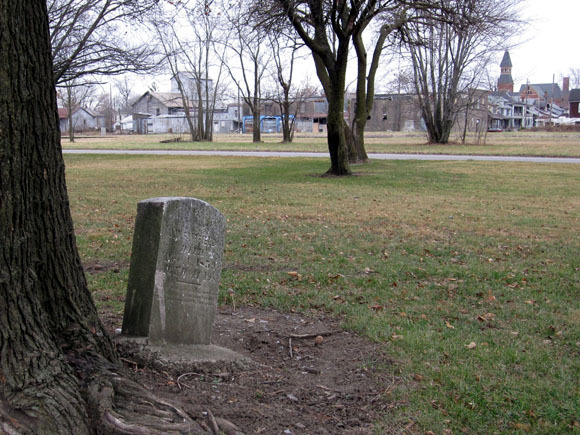 However, Marion ‘s oldest cemetery, laid out by Eber Baker himself in 1822, is actually situated on a two-and-a-half acre piece of land on Quarry Street. One of the few remaining upright grave markers in the Quarry Street Cemetery. Paul J. Midlam did a survey of Marion County cemeteries back in the 1970s and 80s and published them in his book, Cemetery Inscriptions of Marion County, Ohio. He writes that the cemetery has gone by a few different names: the Old Marion Cemetery, Pioneer Cemetery and the Quarry Street Cemetery. As the city’s oldest graveyard, it’s also the final resting place of a number of historically significant people, including members of Eber Baker’s family as well as David Potts, a Revolutionary War veteran. Most of the remaining tombstones are simply lying helter skelter in a small enclosure in the middle of the cemetery. At first glance, the plot of land doesn’t look much like a cemetery. In fact, with its trees, the flag in the middle and its frequent use as a playground by neighborhood children, the cemetery almost resembles a park (albeit a boring one). Midlam offers a few reasons why the graveyard looks so un-graveyard like. First, the iron fence that once surrounded the property is long gone, and, more significantly, many of the tombstones are missing. (An interesting but unsubstantiated story around town is that the city removed many of the upright tombstones to make mowing the land easier. Supposedly, many of the stones are now buried beneath the hill in Lincoln Park, though why they should be there is anyone’s guess.) According to Midlam, vandals have destroyed a good number of the tombstones as well. 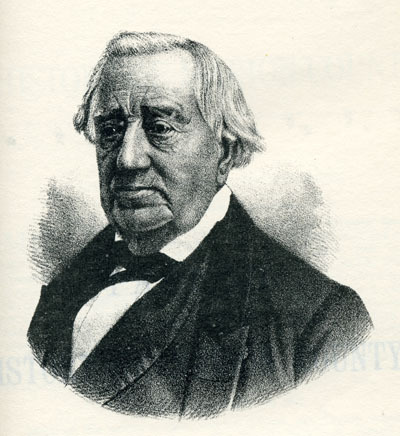 Marion founder Eber Baker. His wife, Lydia, died in 1843 and was buried in the Old Cemetery. However, her remains were later moved to the Marion Cemetery. Perhaps the most macabre bit of history concerning the Old Cemetery is its role as the final resting place for many of the victims of a cholera epidemic that struck with terrifying swiftness during the summer of 1854. Cholera, a bacterial infection that spreads through contaminated water and causes diarrhea, vomiting and cramps, was a serious public health concern during the 19th century. Today, thanks to antibiotics and modern water treatment systems, it has been virtually eliminated in the United States. The Buckeye Eagle, one of Marion’s first newspapers, ran a story on July 20th, 1854, marking the appearance of cholera in Marion and calling it the “full scourge of mankind.” However, the paper was still relatively optimistic, as there had been, up till then, “but two or three cases, and these amongst the foreign (i.e. out of town) population.” Unfortunately for the residents of Marion, the epidemic was just the beginning. This old postcard, courtesy of Mike Crane, shows how the cemetery looked just after the turn of the century. To see more old Marion postcards, check out Mike’s website. Bear in mind that the population of Marion at the time was just over 1300. That means that the epidemic killed one out of every twenty people in town and did so within the span of a few weeks. If a similarly deadly epidemic were to strike Marion today, it would kill approximately 1750 people. After the epidemic many of the Quarry Street Cemetery’s vacant plots were suddenly occupied and this (along with noisy new rail lines across the street) hastened both the creation of the much larger Marion Cemetery a few years later and the subsequent decline, in both importance and upkeep, of the Quarry Street Cemetery. Trying to find some names of people who are buried and died from cholera. I have 4 relatives named Kopp from the 1850’s. Thanks for any info. Years ago I heard there was a cemetery or some tombstones in the small wooded area west of Lincoln Hill but never investigated it. Also, this article mentions this is Marion’s oldest cemetery. I believe that Marion’s ‘first’ cemetery was located where the Marion water tower sits. This is a great website. Thanks. You can find the first cemetery behind a home on Columbia St. On the corner of Columbia and Prospect. Go west one or 2 houses. Check the back yard. I remember seeing it years ago. Hi Cindy, thanks for the info! Do you mean it’s in someone’s back yard? Are there any tombstones or other evidence that that’s where a cemetery was? Yes. A brick home right by the alley west of S State. I grew up by Quarry St. and spent most of my days playing football and eating mullberrys in that graveyard, not to mention my first fights with many to come along with some more fun. Growing up we were told it was the black plague that had killed the people buried there. I lived on Bellevue for a couple of years. My family would play ball in this cemetery. My two young girls and I would put the so few tombstones together as though they were a puzzle. Looking for Samuel Poston’s grave. He may have lived in Marion. He was born 1793. I used to leave flowers on the graves out of respect for the dead because so few cared about the headstones they were running on top of and the vandalism that had taken place. Being in a paranormal group, it was the most I could do to try and let those who have passed know that they are still being honored and in our memory. They were here long before us and had to lead more difficult lives than any of us could possibly understand. That cemetery definitely needs to be respected and needs a face lift. Stones need to be replaced and some put in to identify those who are in the ground that have no headstone.